I called these posts "speed reads" because I really zipped through the book, skimming and scanning and synthesizing my own understandings into the statements below. I trust that readers will use the comment block below to correct me if I have erred in understanding, or to share their experiences and understandings of the text and extend the conversation. In 1915, John Dewey observed, "If we teach today's students as we taught yesterday's, we rob them of tomorrow." This quote sets the stage for introducing innovations in technology, new tools of teaching and learning, that enable/require new ways of thinking about how, where, why, when, and with whom we learn. This chapter explores historical innovations and how education has adopted or resisted change. Technology itself necessitates development of new skill sets. What communities value and demand of their educational programs evolves rapidly, yet institutional reforms are slow to change. West explains the possibilities for individualization in learning programs made possible with technology. Breaking from production models where every child learns the same thing at the same time over a dozen years of schooling, personalized learning opens the door to personal pursuits that are more engaging, personally meaningful, and effective at achieving learning goals. Translating traditional learning programs to digital format is insufficient; rather, a complete rethinking of programming, content, community, engagement, and assessment is required to elicit technology's benefits for teaching and learning. Interactivity amongst internet users in the forms of social media and blogging spurred the creation of learning communities and professional networks. The ease with which a user can communicate, collaborate, and publish is revolutionizing the publishing industry. Groups can now source their own learning content, can assemble materials and activities to support each other. Classrooms of students can collaborate with others half-a-world away. Virtual learning spaces are ubiquitous, mobile, flexible, and both synchronous and asynchronous. Information distribution is no longer an expensive proposition - anyone can create a platform for their message and assemble communities of like-minded people. Publishing, collaborating, co-creating, and synchronous discussions can be local to world-wide distribution. Play as an essential skill speaks to the value of creativity, nurturing exploration to find new ways of understanding. It speaks to how we come to understand - through inquiry rather than direct instruction. Gaming has long been a fixture of computing; adopting gaming strategies into instruction is a growing field. Feedback systems, formative and summative assessment built into a scaled / leveled set of engaging experiences in the context of a game is a powerfully motivating learning environment. Speaking to Augmented Reality, West focuses mostly on virtual environments and simulations rather than the superimposition of digital data on physical reality when viewed through a digital device. He describes the value of immersion in a situation, experimenting to understand variable and decision-making that results in a dynamic and complex articulation of the decision consequences. Interactive response systems, microblogging backchannels, and content delivery systems with embedded assessment tools provide in-the-moment data reflecting learner engagement, understanding, and content mastery. Technology provides a foundation for learning systems that customize a program based on the learner's responses. Testing student understanding can be immediate and come with analytics highlighting deficits and pointing to next learning steps. Using computers to perform statistical analyses of student test scores is offered as a method of determining the effectiveness of the individual teacher with a group of students. West acknowledges the controversy surrounding this application of technology. Nevertheless, technology enables more complex, detailed, and specific data processing than ever before.That these powers are used in novel and innovative ways is not surprising but West also highlights the disputes over how well the resulting data measures what proponents claim it measures. While correspondence courses have been around for decades, technology enabled more frequent communication and engagement with a learning community as well as the delivery and production of multimedia materials to support learning. Again, the message must be adapted to make best use of the technology. Instructional design that recognizes and capitalizes on the unique opportunities provided by technology will lead to quality programming, one of the greatest concerns expressed by leaders in higher education. The same technologies used to deliver learning programs at a distance are also being used to supplement and augment in-class learning. The Flipped Classroom sees students engage with content at home and learning activities at school with the assistance of peers and educators. While some initiatives provide open access to learning materials, some for-profit providers have a foothold in the industry raising concerns on both sides over quality, exploitation of funding programs in order to maximize profits. Students with special learning needs are finding technology solutions that compensate for elements of their learning challenge. Foreign language learners have instant access to translation services as well as audio/visual examples available on demand to develop proficiency. Assistive technologies are much more accessible than they once were and West acknowledges the importance of teacher training to understand and use them effectively. Technology is an engaging platform for teaching and learning, alone it is insufficient to create a revolution in education. Opening our minds to the possibilities that it brings about in how we do education is a first step. Technology creates new ways of engaging with each other, new forums for creating community, new contexts for learning. Traditional classrooms, indeed, school buildings themselves, are mismatched to the most effective applications for teaching and learning. West, D. M., 1954. (2012). 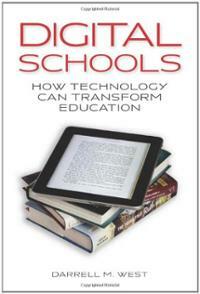 Digital schools: How technology can transform education. Washington, D.C: Brookings Institution.